I believe Geraldo is a member of the mainstream media sleaze who will do anything to protect their socialist/progressive conveniently black president. I do not wish to argue the validity of the mournful poppa Woods' statement. However, I must say that I find Geraldo's efforts to bend over backwards to defend and be fair to Obama a bit much to stomach. Remember the JonBenet Ramsey murder? On his TV talk show, Geraldo relentlessly lead the charge of suspicion against the parents of the murdered six year old girl. I remember thinking how arrogant and cruel it was for Geraldo to fan the flames of suspicion against the devastated parents, John and Patsy Ramsey, in the court of public opinion without any real evidence of their guilt. Patsy Ramsey said she walked in her house one day and heard herself accused of murder by a guest on the Geraldo Rivera Show. Geraldo hosted a mock TV trial which convicted Patsy Ramsey of murdering her daughter. 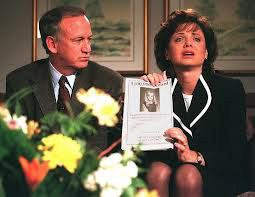 The JonBenet Ramsey murder was a worldwide news story. Had there been sufficient evidence, the Ramseys would have been indicted. They never were. Upon milking every drop of TV ratings out of the Ramsey case, Geraldo's talk show moved on to other topics. The JonBenet Ramsey murder case remains unsolved. Patsy Ramsey died of Cancer. Geraldo's behavior towards the Ramseys was a perfect example of what Rush Limbaugh describes as the "drive by media"; similar to a drive by shooting. The mainstream media appears on the scene, wrecks havoc and many times destroys innocent lives. Without remorse or apology, they simply move on to the next breaking story. Geraldo and his liberal mainstream media buddies lack scruples. They will say and do whatever it takes to drag Obama across the finish line, giving him four more years to implement their socialistic/progressive agenda. Obama's minions must be defeated.